TS EDCET Results 2016: Telangana B.Ed Entrance Results 2016 are to be announced on date 12th June, 2016. 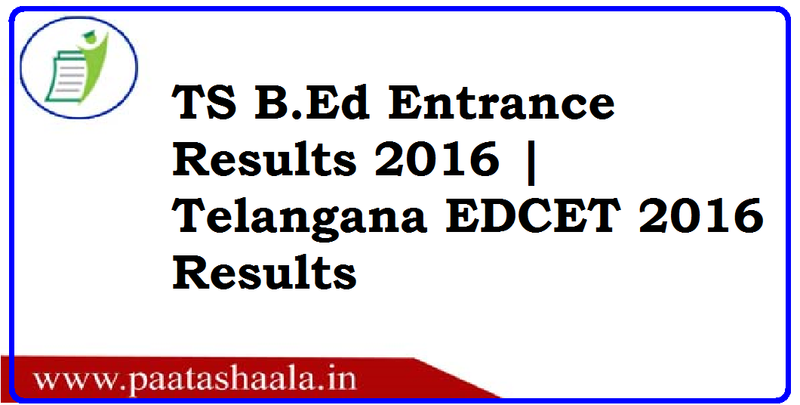 Candidates can check TS Ed.CET-2016 Results and download rank cards at www.tsedcet.org. Telangana EDCET 2016 question and answer keys download for all Methodologies. TS B.Ed entrance all set wise solved question & answer keys are available to download here for exam conducted on 27th May, 2016. TS Ed.CET A Common Entrance Exam for admission into 2yr B.Ed courses designated as Telangana State Education Common Entrance Test. This is also called as TS B.Ed Entrance Test conducted by the CONVENER, TSEd.CET, Osmania University, Hyderabad in accordance with G.O. Ms. No. 72 (SE Trg-1) Dept. dt. 05-07-2004 on behalf of the Telangana State Council of Higher Education (TSCHE). This exam will be conducted every year by the state government. This will be 2nd time to conduct this B.Ed admission test after the formation of Telangana State. Previously EDCET was conducted in Andhra Pradesh state. Eligible Candidates may submit their applications ONLINE mode only from 14.03.2016. Application registration fee of Rs. 300/- (Rs.150/- for SC/ ST) may be paid at TS Online/AP Online/Mee-Seva/E-Seva Centres in Telangana State or A.P/ through Payment Gateway (Credit card/Debit card). The detailed information regarding the eligibility, syllabus, model paper, related instructions and procedure for online submission of applications will be available soon.